It’s days like these where you think: If my morning was like this, I can only imagine what the rest of the day is going to be like! I just want to crawl back in bed, turn my alarm ON, and start over…wake up and I’ll be given a “re-do”. But, it doesn’t happen that way. So, I guess I just want to encourage you to make the best of each day. Pray. If your morning starts rough…pray. If your morning’s great, but afternoon is tough…pray. For me, when I do this, things get put into perspective. I realize that there is ALWAYS something to be thankful for…there is ALWAYS someone who is having a much worse day…and there is ALWAYS someone there who is going to listen…so PRAY. I don’t guarantee that your days will get easier, but they’ll be easier to deal with!! So, maybe Ray and I are the only parents that are so cruel, we actually do this…so please don’t judge us. 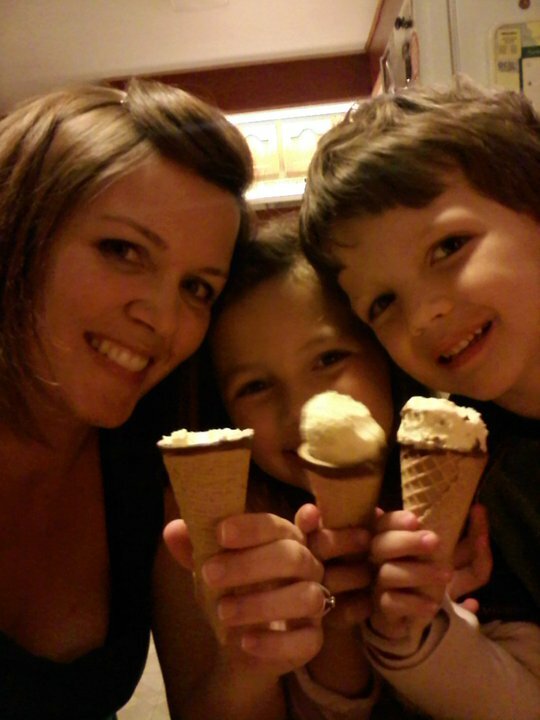 But every once in a while (after the kids go to bed, of course) one of us goes to the store and buys ice cream. Very rarely do we actually have any in the freezer, so it’s a late night “you buy, I’ll fly” type of conversation we have. Sometimes it’s drumsticks, other times it’s Snickers ice cream bars…but nonetheless, it’s something to cure our longing for ice cream. It’s so funny to me that we do this because everyday we drill it into our kids’ heads…”SHARE”! So why do we wait for the kids to go to sleep to indulge in our sweet treats?…Sneaking so quietly into the freezer so we don’t wake any of our crumb snatchers up. I think that it takes me longer to open up my drumstick than it does to actually eat it! Ever so gently grabbing the corners of the wrapper, making sure that I don’t make any sudden “crinkly wrapper” sounds. The answer is simple…because Mommy doesn’t always want to share. I spend all of my day sharing my lunch, snacks, drinks, legs, and lap with my kids. So lay off my Drumsticks! The first couple bites of my ice cream of choice are so delicious…but once I am almost finished with my treat (usually a Drumstick) I start to feel a little guilty. I almost feel like Danny Tanner, Uncle Jesse and Uncle Joey are going to walk in, and bust us divulging in our ice cream, and worst of all…not sharing! Cue the dramatic music…and here comes the moral moment. 🙂 Honestly, by the time I am done with my ice cream, I’m over feeling guilty. Wow, that thought vanished just about as fast as my Drumstick! Until, the next morning the kids go throw something away and I hear, “Heeeeeey, no fair! When did you guys get ice cream?” Seriously, does anyone else’s kids do an inventory on what’s in the trashcan, or just mine? Anyway, don’t get me wrong, I am not always so stingy with my ice cream…but when it comes to Drumsticks, I might hold those a little bit tighter, hide them behind the bag of frozen peas in the freezer, and sometimes hide them in the garage freezer. Really, I have shared my Drumsticks with my family…once. See, I even have proof. So, I have to share. I just submitted my first “piece” (still sounds weird) to the Greeley Tribune Mom Team editorial that I have asked to be a part of. I feel like I just drank a Rockstar. Not the little one either…the great, big, tall one… with a lid! I have so many thoughts, ideas and just stuff going through my head right now. I am so excited and happy, yet I feel like if I watch an episode of The Voice or X-Factor I might lose control of this huge lump I have in my throat! I am completely thrilled that I was asked to take part of the Tribune’s venture to add “online only” content, and even better, that it’s geared towards Mom’s! The even cooler part is that there will be a link from my tribune pieces directly to my blog. I am pumped can you tell? I feel like a complete dork because I feel like I just took a tiny piece of paper out of my pocket, unfolded it, and I’m about to thank everyone who made this possible. 🙂 Don’t worry…we’ll go to commercial break instead. Anyway, thanks to all of you who take time to read my crazy blogs! Look for me at greeleytribune.com coming soon! Are the Referees Doing the Robot? So, tonight I sit here with Ray watching the Denver Broncos play…on our tv…together. Never in our entire marriage, did I ever think we would be watching football…on our tv…together. Ever since I have known him, Ray has never been one to perk up his ears when he has heard Monday Night Football…it’s more of a tune out. This has never bothered me because, honestly, although I would consider myself a Bronco fan, I don’t sit and watch the games either. Then, we leave it up to Facebook and Twitter to give us the play by plays and game winning announcements. But, this last week, Ray decided to give watching football a try. We have been eagerly waiting this Monday night football game (even though I had to ask what time it was on about 6 times today). When I got ready this morning, I put on my orange and blue shirt, my Bronco socks, blew up a giant football, and got out my dusty horse head helmet. Unfortunately, I then looked at the clock and realized I still had about 10 hours until kickoff. Then, when time got closer of course, the kids and I went to the store and got “football” food and came home…again, anxiously awaiting the game! Ray got home, we ate our pizza, Doritos, bean dip and drank our orange Fanta (I know true Bronco fans drink Orange Crush, but I am frugal and Fanta was only $1)…and it was time! We all found our seats on the couch, got out the board games, began to play Headbanz, the football game started and it….was….so…awkward. I have to admit, it felt so unfamiliar I was almost uncomfortable. What do they say? Football is like the hearbeat of America…wait, that’s Chevy. However the saying goes, I know that football is an intricate part of our society, yet in our house…on our tv…it is weird! Have you ever done something that you thought would be a great idea, but it left you feeling so uncomfortable you wanted to back out? I turned 30 this last month, and it really made me realize that if I am not uncomfortable within my skin sometimes, I’m not doing something right. In other words, if I am not doing something that challenges me, I’m not going to grow. This is why I have decided to begin writing a blog. The first blog I wrote scared the crap out of me…As soon as I pushed send, I became my worst critic. What are people going to think? Am I really as funny as I think I am? For any of you that know me, I am not a public speaker…that is why a blog sounded so tempting to me. Recently, I had my first meeting as PTO president within our school (didn’t I just say I’m not a public speaker? ), and once again…I have never felt so uncomfortable. I looked up the definition of strange and it says: Unusual or surprising in a way that is unsettling or hard to understand. There you have it…not everything that makes you uncomfortable is bad. It can be surprising, yet hard to understand. I don’t understand many things (like why I was selected for a leadership position, or even the talk of “rent a refs”) but I do know that I am growing as a person, and I am excited about that. I am all about growth and bettering yourself, which is why I have been so supportive and excited for Ray when he decided he wanted to start watching football. He has been SO unbelievably supportive with the small steps that I have taken over these last few months, so I want to do the exact same for him. So, if I could leave you with a tidbit of advice tonight it would be this: No matter how big or small their dream is, always be supportive of your spouse. It might be uncomfortable because it’s not something that you can understand, but be there for them. Even if you’re sitting on a couch with luke warm bean dip and a watered down Fanta, trying to understand those crazy robot hand signals the refs do… at least you’re doing it together. I love my husband, and his new found love for football, and the Denver Broncos. Today was the very first time that Eydan (my 14 month old) got the opportunity of playing at the McDonald’s Play Place…and let me tell you, it was just how I imagined it would go. After a few tries, he finally managed to climb up the very first step…with a little help from his forehead, he was standing at the mouth of the multicolored monster! He paused there for a second, turned around to look at Ray and I (almost as if he was saying his final goodbyes) and headed up the plastic spiral staircase. There were giggles, and playful screams coming from Eydan and his little friend Steven that we brought along, and pretty soon Steven comes down the slide. Eydan was stuck in the intestines of the monster to fend for himself. Pause. Commence the “Eydan scream”. He was in an unfamiliar place, surrounded by sticky plastic (and probably some foul smells), and not sure how he was ever going to escape. Mommy to the rescue. After circling the equipment to try to figure out where he was exactly, I finally came to the conclusion that he was in the slide. Let me back up about 20 years because that’s probably the last time I climbed UP a bright red, cylindrical, corkscrew slide…the monster’s intestines. I head in the slide, only to pause and look back at Ray just like Eydan did because I thought for sure this would be the last time I saw his face. (In all reality though, I turned around to make sure he wasn’t getting out his phone to take a picture of my fanny hanging out of the slide that was about to engulf me…to my surprise, he wasn’t). I head up the slide. Eydan is still screaming which makes me climb even faster…that hurts 30 year old knees, let me tell you. I get half way up the slide, and here comes Eydan shooting down like a bolt of lightening, with a HUGE smile on his face! I was so proud of him! I could even imagine him, speaking in an Australian accent (kind of like Steve Irwin), “Crickey, there’s only one way out of this monster, mate…I’m going to have to slide down right out of it’s belly. Cheerio!” No clue why I picture him speaking like that, or if Australian’s say “Cheerio” …but it’s pretty funny to think of. Anyway, I catch Eydan half way down the slide, and we slide (more like scooch) down the rest of the slide together. Phew. Glad that’s over, now I can go finish my lunch. Oh wait, he’s on his way back up the stairs. This time, he got half way up the stairs, and realized he wanted to come back down. Daddy to the rescue this time… (I couldn’t get my phone out in time to snap a picture of his fanny hanging out of the staircase). All Eydan needed was to hold a finger…not even a hand. He wanted 1 finger to help him down the stairs. Ray brings him over to the table and with a frightened look on his face says, “Houston, we have a problem.” He holds Eydan up and to our dismay, he has no diaper on, yet his pants are still buttoned. Not only do I have a mini Steve Irwin for a son, he’s also a magician! How in the world does this happen? Ray and I couldn’t quit laughing once we looked at Eydan’s bulging leg…his diaper was stuffed down one pant leg. He tricked us, once again. I like to think it was some sort of defense tactic he used when he was stuck in the guts of the monster. Until next time, McDonald’s Play Place. Not sure if many people know, but September is Childhood Cancer Awareness month, and tonight one of my favorite 4 year old girls is on my heart. One year and a month ago, she was diagnosed with Acute Lymphoblastic Leukemia (ALL). I remember getting the phone call and all I could do was sit, numb on the couch. What could I possibly do for 2 of my best friends, their daughter, and their brand new, two day old baby. I started watching Leah when she was 2 months old, up until about 3 months before she was diagnosed. I have always treated her as one of my own kids, and Elijah and her have always been such great friends. For some reason they have always had a special bond. (I like to think it’s because some day they’ll be married.) Anyway, I remember the last winter that I had Leah, we had a mouse in the house. For any of you that know me well, I don’t like mice, at all. In fact, if I see one, I usually let out a very annoying scream, start to cry, and then I jump on the closest thing I can get to. That day, it was our kitchen table. As soon as Leah heard me crying on the phone to Ray, she came running in the kitchen. She looked at me, and saw the complete fear on my face, and she proceeded to get up on top of the table and just sit there with me. I had a house full of kids that day because it was Christmas break, but Leah was the only one who came into the room. She knew I was terrified, so she just sat. I remember telling her it was alright and she could go play with the other kids, but she looked at me and said, “It’s ok Miss Caiti, I’ll sit with you.” So we sat…and sat. 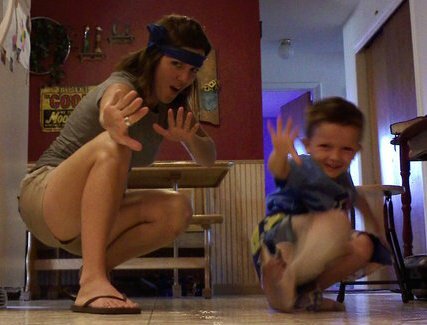 We were on top of the kitchen table for a good 30 minutes when we finally decided to get down…together. I know that this last year has been the most difficult year for Leah’s entire family, and friends included. Leah has made more visits to Children’s Hospital than any child should ever have to make in their entire lifetime. Her family is one of the most generous, loving families I have ever come to know…and I feel so blessed to be part of such a special little girl’s life. 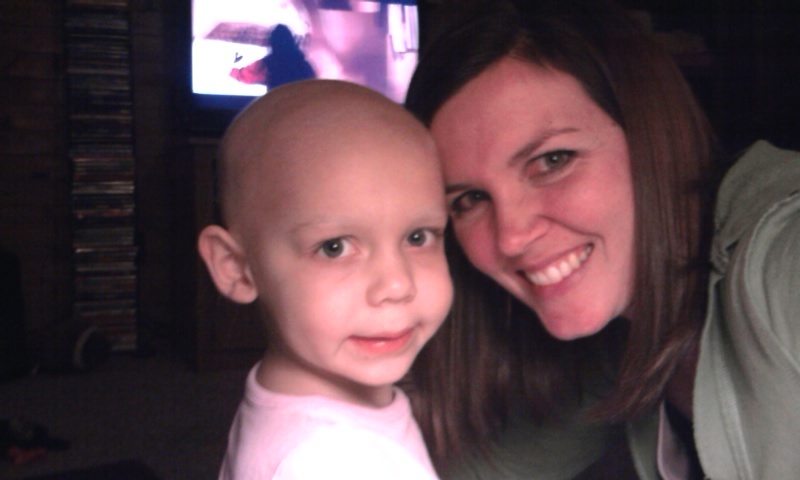 For a while, it was hard to see the light in Leah’s beautiful blue eyes…cancer is ugly. That was probably the hardest time for me, was seeing Leah completely wiped of any energy…to even walk up the stairs to her bedroom. No child, parent, Nana, Mimi, Papa, cousin, Aunt, Uncle, or friend should ever have to go through what Leah’s family has been through…but I just want them to all know how much they are loved. Although some days might seem dark, I will always be here to “sit on your kitchen table” with you, just like Leah sat with me. The world is definitely a more beautiful place with Miss Leah in it. She has touched more people than she will ever know, and I hope this encourages others to reach out…you never know when someone needs you to just sit with them. Please, if you get a chance, go like “Free Leah’s Butterfly” on Facebook, and check out the beautiful video for Leah’s “Cancerversary”. Miss Caiti loves you little Leah. So I should probably be sitting here folding these 3 overly full laundry baskets of clothes, but instead, I would like to share a story. Yesterday morning, I was feeling a little overwhelmed doing my morning “routine” of waking the kids up for school. (I like to picture myself like a whispering fairy gently flying into their room, and kissing their cheeks to wake them up…but in reality I probably sound more like a drill sergeant). Anyway, as I am finally getting Emaleigh nudged enough to where she’s sitting up in bed, Elijah walks in. The first thing she says is, “Bubba, were you crying for Batman at like 1 o’clock this morning?” He just kind of giggled and replied, “Oh yeah, I meant to call Mommy, but I called the wrong name.” Both of the kids just started giggling, Em got down from bed, and Elijah returned to his room. Knowing that they had both forgotten about it, I didn’t bring it up again…but I thought about it ALL DAY LONG. I couldn’t help but feel special that my 6 year old boy, who LOVES Superheroes had mistaken my name for Batman! Now, some might think, “Well, Caiti they DO sound alot alike. Easy mistake. Mommy…Batman. I’m sure he just got mixed up.” But to me…this is HUGE. Then it hit me. Although it was just a half asleep mistake…deep down, I might really be his Batman! Woah! Boy, do I feel under-qualified to take on such a name! Then I thought about the power of a MOM. We really are like Superheroes! We do so much for not only our kids, but for our entire family. So much of our “Bruce Wayne” (Batman’s real name…wow, a little bit of “dork” just popped out of my mouth) is pushed aside so that we can take on the role of “Batman”. Just like in the movies, something always goes wrong, but in the end, Batman redeems himself. As a mom, I can totally relate to this. There are days where I feel like nothing goes right…the sprinkler broke so I have to take 2 hours to fix it, ran out of milk so can’t make what I had planned for lunch, dropped the iron so I can’ t iron work shirts, washer overflows so I can’t wash clothes! I know, Batman has MUCH worse days, right? But then there are some days where I feel like I am on top of the world..I have laundry done, dishes put away, kids down for a nap, floors mopped, dinner in the oven…I have even showered and gotten dressed (That’s HUGE) All in all, the life of a superhero is sometimes stressful, and some jobs go overlooked…but in the end, my “superhero” life is totally worth it. I might not be able to save the world…but I have the ability to save their day…and possibly the burned casserole in the oven. I might not have a bat signal, but I have a baby monitor that works just the same! I don’t have a cape, but I could sew a pretty awesome one. I might not know how to fight the “bad guys”, but I pray with my kids every night…and that’s a start.